The authors have produced a well-written, concise and even-handed exploration of the key aspects of this topic. In seven chapters, they comprehensively explore the history and meaning of this ‘deceptively simple term’. They consider issues of cause and risk, and treatment and management, with the closing chapters focusing on future trends in research and understanding, and the broader societal impact of depression. 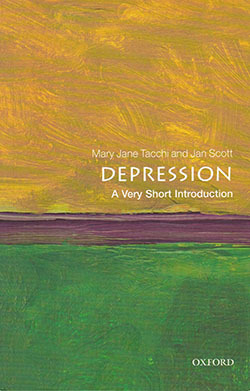 The section on the history of depression is particularly lucid, providing a review of changing views and approaches that has remarkable breadth and detail for such a short summary. The authors’ familiarity with their topic is abundantly clear. Their cognisance of the wider historical and social context, and ability to summarise theory and research, is a real asset. This is a must-read work for anyone with an interest in the topic. My only reservations relate to size and structure. The small font size, lack of text boxes and limited consideration of clinical guidelines may limit the book’s usefulness for those who would like a more direct link between broad exploration and clinical application. This not a mini textbook or treatment manual but nonetheless is essential reading for those wishing to expand their understanding of depression.